Thursday is GURPS Day! 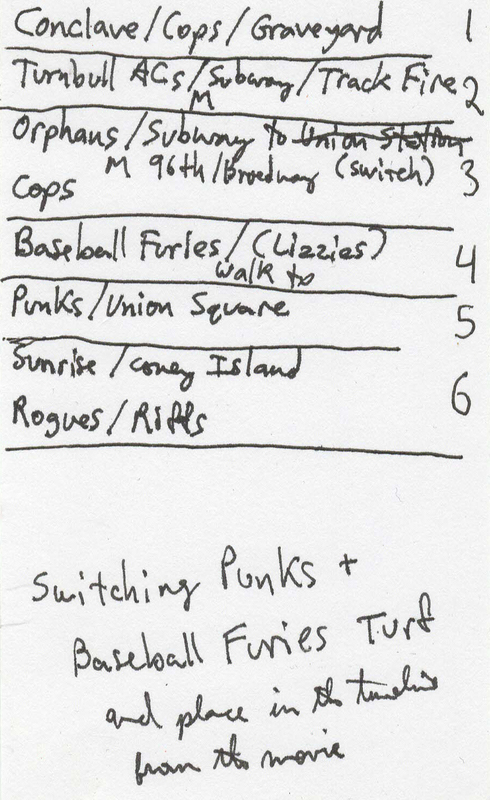 And we will definitely be getting our GURPS on, but I’ve had to change up the schedule a bit. I attended the ever-wondrous Gateway 2015 convention this past weekend, and had planned to post a recap of the games I played on Tuesday, the games I GMed on Wednesday, and the regularly scheduled “New to GURPS” installment today. So, a couple of years back I wrote some posts on the “Cynosure Romp” convention game I GMed, showing the step-by-step from “fuzzy idea” to “what I’m using at the table.” I love talking to other GMs about how they do this exact thing (so I can assimilate all the best ideas, of course, Borg-style), and more than a few people at the convention asked for more info on the “Warriors” game, so this seems like the perfect time to dissect my prep for that game. I’ll try not to repeat too much from the previous posts. I’ve streamlined some things down, and naturally every game has its own unique needs, but the steps of the process remained surprisingly similar. Knowing what I was running now, I just wanted to make it a bit more… concrete. This is the “elevator pitch” step, so I expanded my initial note of “Warriors game” to “A game where the PCs are members of the Warriors street gang from the 1979 movie.” Oh, yeah, we’re cookin’ now! That step only took like 10 seconds! Okay, now the first actual decisions. The biggest was, should this be a recreation of the original movie or a “sequel,” using the Warriors characters in some brand-new adventure? Rockstar Games released a “Warriors” console video game ten years ago that was actually a great fighter game with a lot of fun missions, so I considered using some of those as inspiration. Ultimately, I decided that framing the story as the original movie was the best of both worlds — once the game started (at Cyrus’ conclave in the Bronx), the players could choose for themselves: either follow along (roughly) the plot from the film, or just go nuts and do their own thing, like take Cyrus’ place on the podium after he’s shot, whip the gangs into a blood frenzy against the invading cops, and lead them on a bloody swath of destruction through the heart of the city (sorry, spoilers for a 35-year-old movie — Cyrus bites it). Turned out, by the way, that all four groups — one playtest and three con runs — stuck more or less with the story beats from the movie, which was an insane amount of fun to GM. Okay, at this point I had a pretty good handle on the broad strokes of the game: the PCs as members of the Warriors, probably making their own way through the events of the movie, but always with the option of doing their own thing (which is true regardless of what I’m running). As always, the most important part of the prep to me. 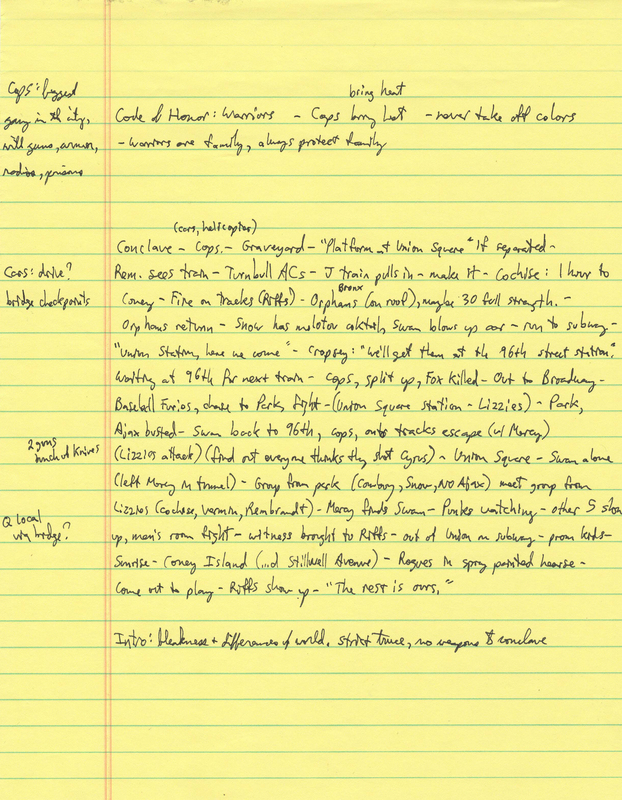 I can (and have) run a one-shot with a stack of complete, ready-to-run, pretty looking PC pre-gens… and a page or two of hastily scrawled notes on the adventure itself. The story bits, those I can leave swimming in my head if I absolutely have to. But the PCs… the players need to be able to see those, hold them in their hands, and they have to look good, be clear, and contain everything the player needs to have a good time running it. PCs: All great fighters, all proactive and competent characters. Once I started mentioning the game to others, though, it seemed likely to have full tables (which is a good thing! ), so I snuck Vermin onto the PCs list to accommodate at least one “extra” character and run with five if an alternate player showed up. You might notice I didn’t really need to divvy the PCs up by “role” for this game, the way I had “2 Support (1 a healer), 3 Ranged (1 a sniper), 3 Melee” for the Cynosure game. The Warriors as presented in the movie, at least the five I chose as PCs, are not finely differentiated — Ajax is a little stronger, Swan is maybe a better leader, but none of them are shown to have any skill with a gun, for example, or first aid beyond wrapping some cloth around a cut arm. The characters won’t need to be nearly as varied as in some games. Armed now with the cast of characters, I sat down and watched the movie again with an eye to noting details and highlights likely to come up in a game. Clicking that image will open it full-size, but for those not fluent in “middle-aged sanskrit,” here is a transcript (warning: it’s pretty rambling). “Cops: biggest gang in the city, with guns, armor, radios, prisons. Code of Honor: Warriors – Cops bring heat; never take off colors; Warriors are family, always protect family. Whew! All right, so there’s the entire movie in 176 words. This, I can work with. I also made a video editing the entire 83-minute movie down to 9:33 of highlights, but obviously that’s in no way necessary… I just felt like playing with Movie Maker for a while, and it was fun. Though, it was great for keeping me in the right mental space as I worked on the game, as I kept it looping on a second monitor. Ooh, okay. Now things are getting manageable! 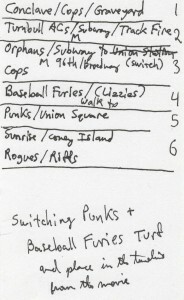 The only outright change I made to the original plot as represented here was the order of encounters — in the movie, the Warriors meet the Furies before the Punks, but the Furies are easily the most iconic gang people remember, so after writing the notecard I thought they should definitely be the penultimate encounter. At this point, all the raw materials were in place and I just had to start shaping them into actual human-readable things. They have info on the movie itself, all the characters, the gangs, their route, pretty much anything you would ever want to know about “The Warriors,” and they helped me out a lot in getting this game ready to run! Check ’em out for all your Warriors needs. 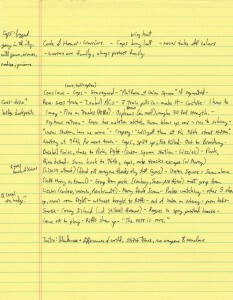 In the meantime, I hope you’ve found some of these notes useful so far, and hope you’ll join me for Part 2. If you aren't willing to die for it, put the word freedom out of your vocabulary.